Summer is nearly upon us. Unless you live in Tampa, Florida, where I’m guessing that the word summer is a relative term. It’s the season when your little ones are absolved from homework and early rises (mostly), a time when the grass will not let you forget how fast it grows, and a period of that unrelenting call of the wild, “There’s nothing to do!” In spite of your children’s grudging acceptance of all-things-and-chores that are school related throughout the other nine months of the year, they are usually quite quick to point out that–as their social director–you must provide them with something to keep their little fingers and minds busy throughout their hiatus. So why not start planning now, while there’s still some relative quiet and ample time? There are many non-iThing ways to engage the kids when it gets warmer, so let’s take a look at a few. And keep in mind that creativity will be your greatest ally in combating the forces of atrophic idleness. If you can elaborate on these activities, by all means do so. Given the penchant that most kids have for drawing on things, along with the ever-growing amount of spaces that are paved with concrete, sidewalk chalk is wonderful way for those tiny tots to express themselves (for hours, and hours, and hours…). But don’t run off to Sidewalk Chalk R’ Us just yet. You can make these colorful tools at home with a few simple ingredients. Best produced in a couple of muffin tins (ice cube trays will work as well), take 1.5 cups of cornstarch and 1.5 cups of water, mix, and divide evenly into the tins. Add 2 or 3 (or whatever) drops of food coloring to each cup, and stir. Let the “cakes” harden, then pop each one from the tins. Instant colored chalk! Break into smaller pieces if necessary, and give some thought to adorning your young Van Goghs with thrift store garmentry (it is colored chalk after all). And finally, send the kids outside and make yourself an iced tea. 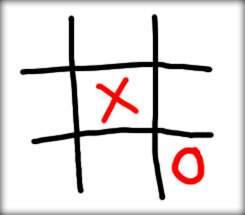 Who doesn’t love a good game of Tic Tac Toe, besides a theoretical physicist I mean? The game has been played for hundreds of years (the ancient Romans engaged in the sport, also known as Noughts and Crosses) and can be enjoyed by just about anyone. Find (or purchase at a garden store) 12-16 round, flat stones (roughly the size for kids to handle easily), and paint Xs and Os on them with white latex paint. Then find a space on the driveway, and (using your sidewalk chalk, LOL!) mark off a grid with 9 spaces, and let the playing begin. Take turns starting, as this is fairly important in this game. If you’re the consummate recycler, you can even substitute plastic jar lids for the stones, and if you want to play in the yard, use square tiles placed on the grass with about an inch between each for the grid. Kick it up a notch by adding extra stones and making the grid into 25 spaces (which will give you a space in the middle). However you approach it, let the kids help. When the sun really starts to shine–as in egg-cooking on the sidewalk shine–I’ve found that the best activities can be found on ice, or in it actually. Grab a few toy dinosaurs (or animals of any type) and place them in a fairly large plastic container, fill with water (add a drop of blue food coloring for effect), and place in the freezer until solid all the way through. When the temp hits the high 90s, pop the dino cube outside somewhere, hand the kids some implements of destruction (screwdrivers, butter knives, etc.) and ask your wannabe arctic explorers to try their hand at resurrecting ancient animals from the azure ice.